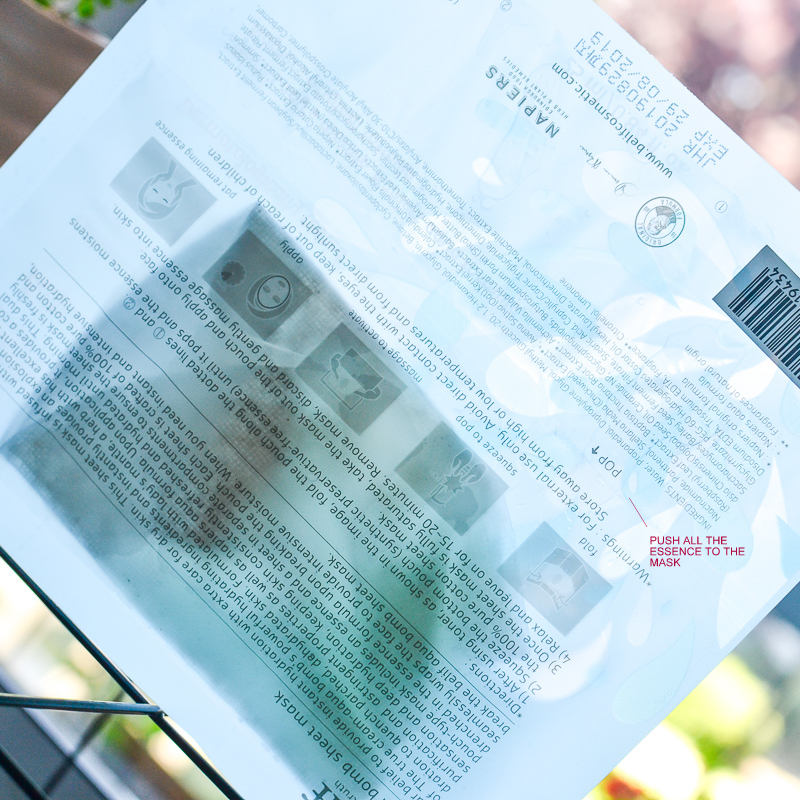 Belif Aqua Bomb Sheet Mask - packaging is a little different from other sheet masks I have tried so far. 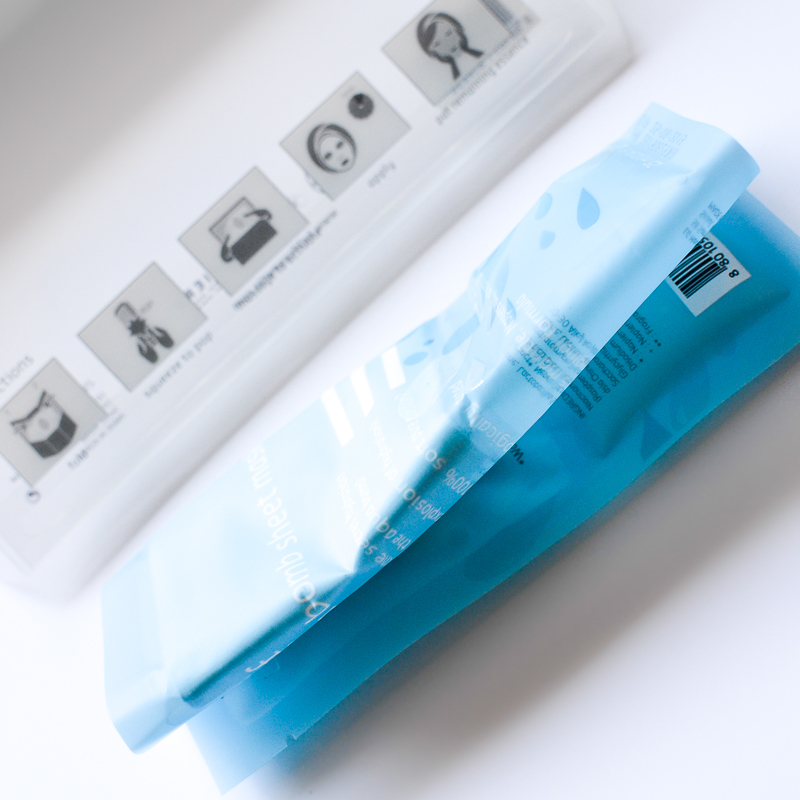 The cotton sheet mask and the essence are packed separately, to be mixed before using. Fold the package as directed in the instructions (along the 1 and 2 markings on the pack). Give the essence portion a good squeeze - not press daintily like I seem to be doing in the photo - until you hear a loud pop. That's the essence pouch popping open inside. 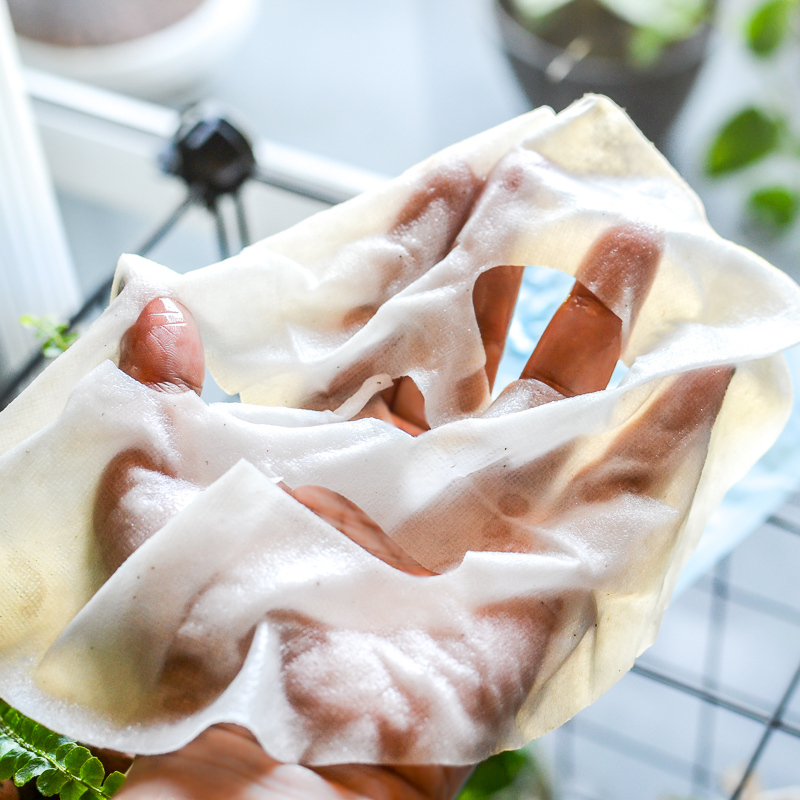 Hold up the essence portion and ensure that all of the essence is squeezed out of it's pouch (through the portion marked "POP") and into the section containing the cotton sheet mask. 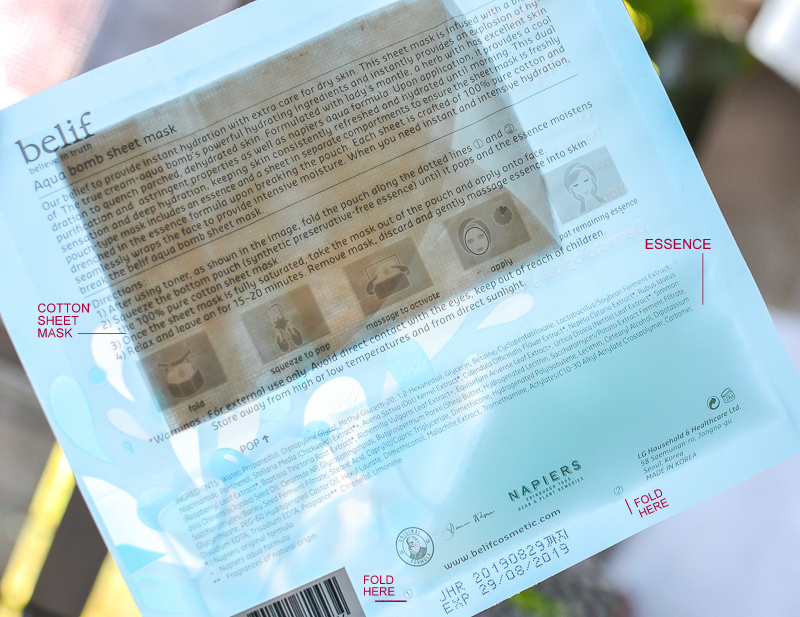 Massage the essence into the cotton mask through the packet to help it spread evenly. There will be dry bits on the mask if you skip this step. 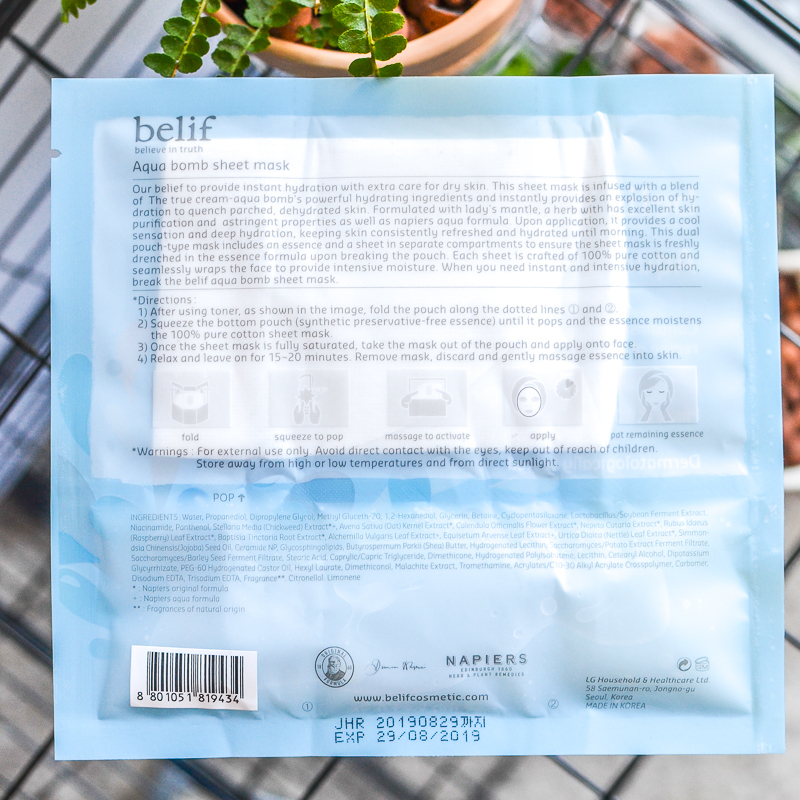 Belif Aqua Bomb Sheet Mask - the mask uses organic, unbleached cotton so it's not going to be a pristine white colored mask. 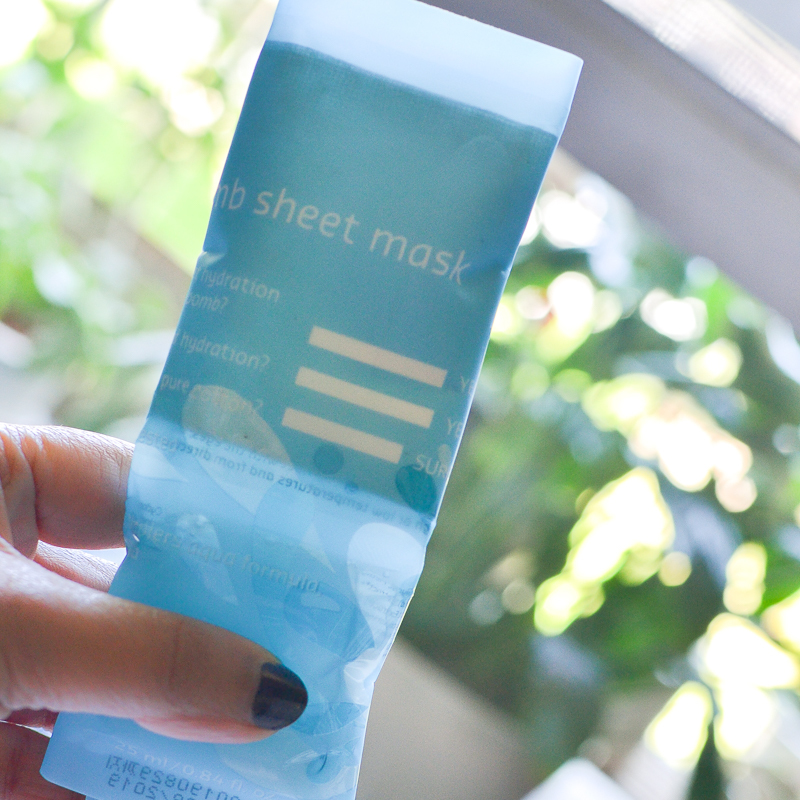 There is a generous amount of essence included in this mask, and the thin cotton sheet mask will be soaking-dripping wet when you pull it out of the pouch. 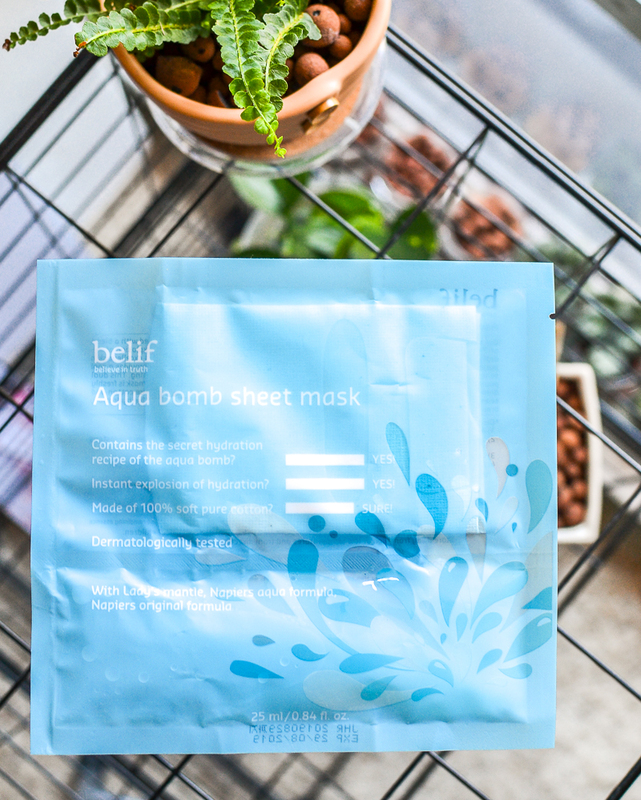 Like most sheet masks, the Belif Aqua Bomb mask needs some minor tweaking to ensure it's properly set on my face, but there is enough material to cover my face (not the tip of the nose, though), and it doesn't slip off my face even if I don't lie down promptly. I haven't tried walking/standing while using this, though, so I couldn't vouch for it's antigravity powers 😛 As for results, the mask leaves my skin saturated with moisture, just the way the Aqua Bomb moisturizer does, but the essence used in the mask feels heavier on the skin. I leave the mask on for about an hour, and there is always a heavy residue on my face once I remove the mask. I do pat it in, but it just sits on the skin and takes a long time to absorb in. For this reason, I prefer using this as an overnight mask. I have oily-combination skin, though, and have never had breakouts or greasy skin the next day with this mask. My skin always feels hydrated, plump, smooth and moisturized the next day. Results are most obvious for about 2 days, so this is perfect to use when my skin is feeling extra dry or stressed. It gives the perfect boost of moisture which I can then maintain with my regular skincare routine. So yes, I love the mask, and I see this hopping into my shopping basket a lot more times in the future. That said, it might be a bit heavy for someone with very oily skin and probably not a good pick if you don't like a lot of residue left behind after using face masks (you could still give it a try as an overnight mask). The one thing I would change about the mask, though, is the the packaging. Each of these single-use packs comes packaged in a hard, clear plastic protective envelope, and it is an unnecessary lot of plastic to add to the trash. The plastic protective envelope does keep the pouch from popping before use, but I do wish Belif (as well as other beauty companies) looked into making product packaging a bit more ecofriendly.